Your heating and air conditioning play a large role in not only your home comfort, but also your utility bills. At Fairfield, we'll help pick out and install the perfect HVAC system to meet your specific needs. We specialize in the installation of cost-effective HVAC solutions including geothermal systems, furnaces, boilers, radiant heat systems, ductless mini split systems, and heat pumps. We offer free estimates and convenient financing options. If you're looking for installation services, contact us today! 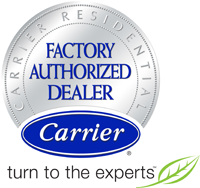 As Factory Authorized Dealers, we are expertly trained professionals who must perform to rigorous national standards consistently and continually in order to qualify for Carrier endorsement. We take pride in doing the job right. In fact, we are so confident that you will be comfortable - not only when you choose Carrier heating and cooling products, but with us - that we're backed by Carrier's 100% satisfaction guarantee.